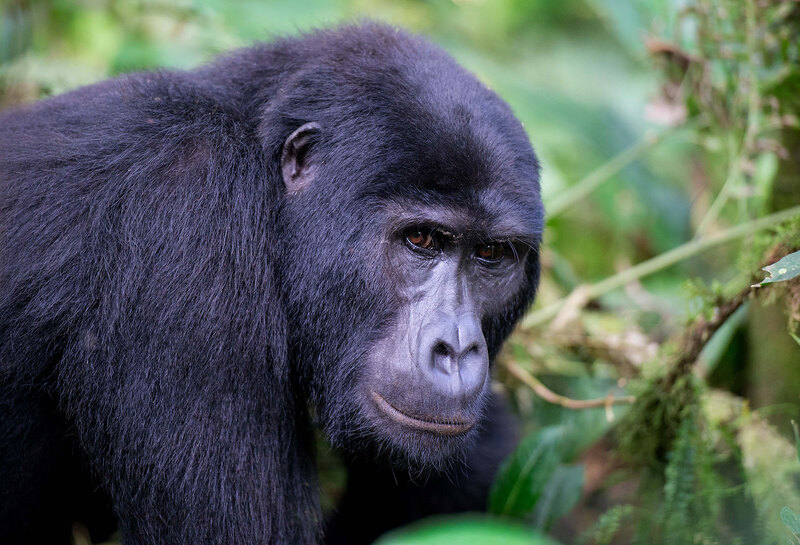 I have been fortunate over the years to see a few of the many great apes in the wild. 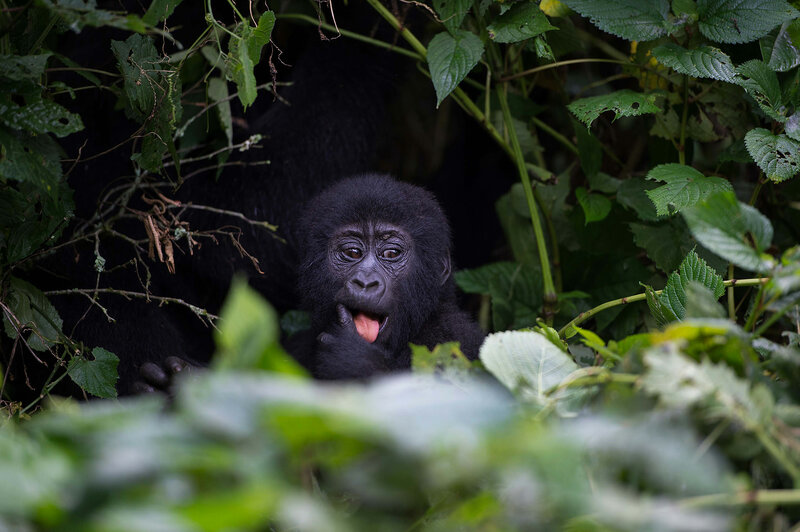 My work includes photographs of some of the highly endangered species such as the mountain gorillas. In this article, I will present my thoughts on the best places to capture these wonderful animals on camera as well as some of the issues I have faced doing so. Finally, I will outline my suggestions for camera and lens selections. 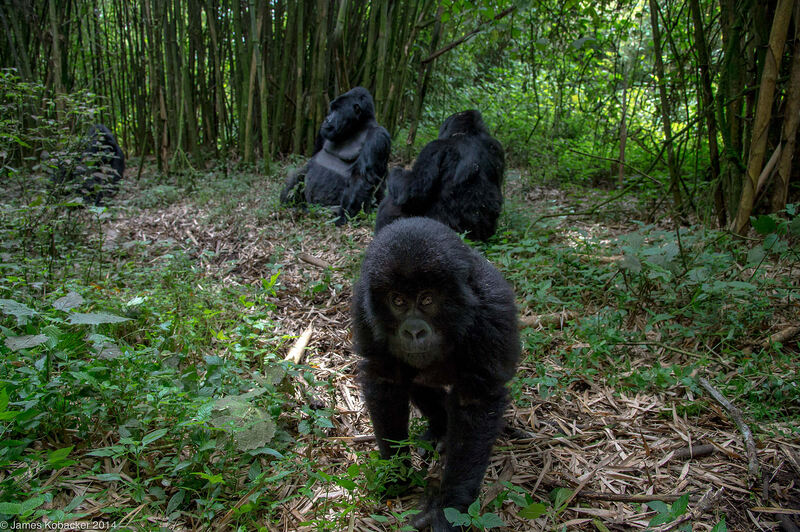 Photographing gorillas can be both a wonderful and frustrating experience. Nothing can prepare you for the experience of being with a 500 pound gorilla that may stand up and look you in the eye or simply lie on the ground as a juvenile gorilla walks over it. The experience is spectacular but getting to the scene can be challenging. 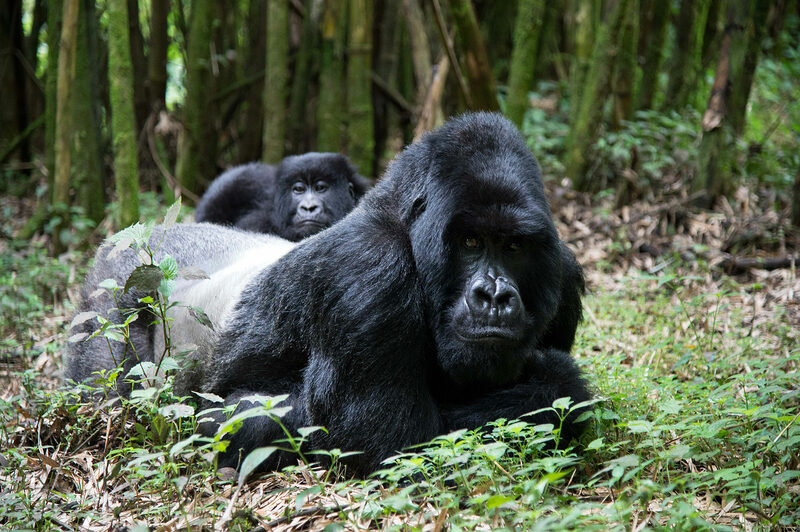 In my experience, the best places to see gorillas in the wild are Uganda and Rwanda (mountain gorillas) and the Republic of Congo (western lowland gorillas.) Wild gorillas are found in other areas but I’ve listed the locations with the most developed habituation programs and tourism industries. 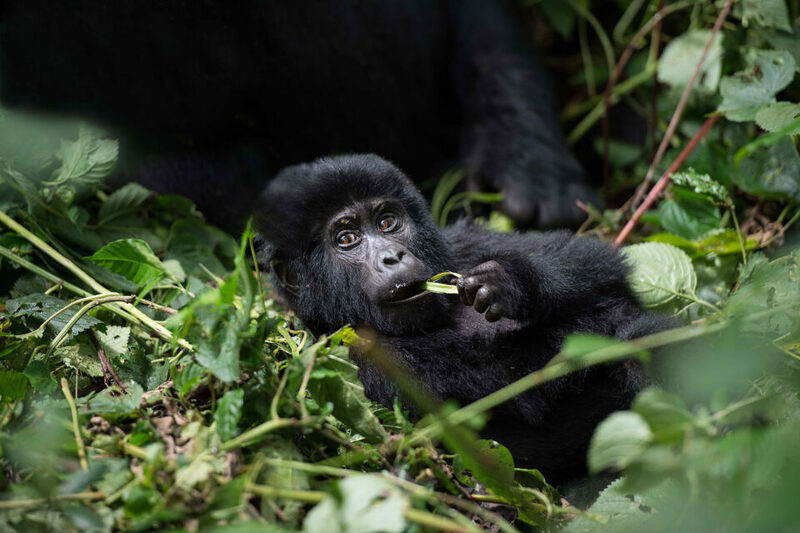 There are certainly positives and negatives involved with each of the areas (listed above) when it comes to the pursuit of photographing gorillas. When considering the various aspects, it is first important to acknowledge the difficulties of getting to the gorillas’ habitats. 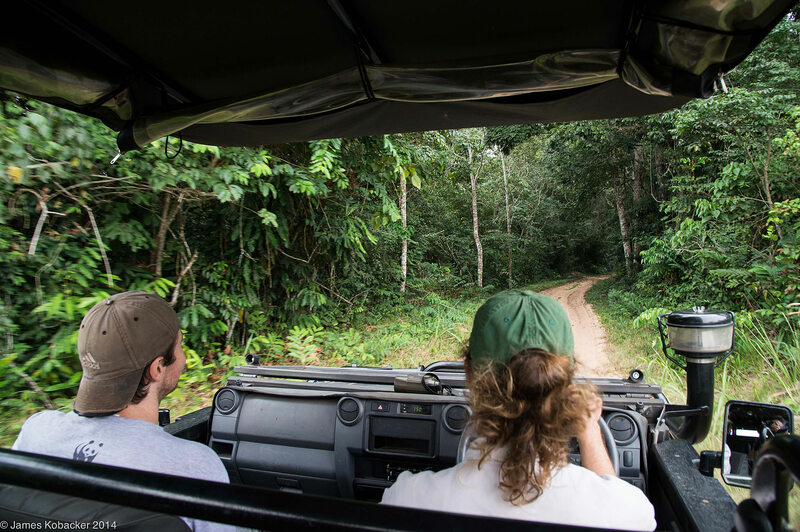 Usually travelers start out from a base camp and hike trails through incredibly thick forests. It is not uncommon to traverse through mud and be rained on quite a bit. The hikes can range from a flat walk for 45 minutes to 12 hours across uneven, difficult terrain, while encountering stinging nettles and possibly bugs. However, the journey is completely worth it to spend time with the gorillas. Rwanda provides the most easily accessible gorilla experience. 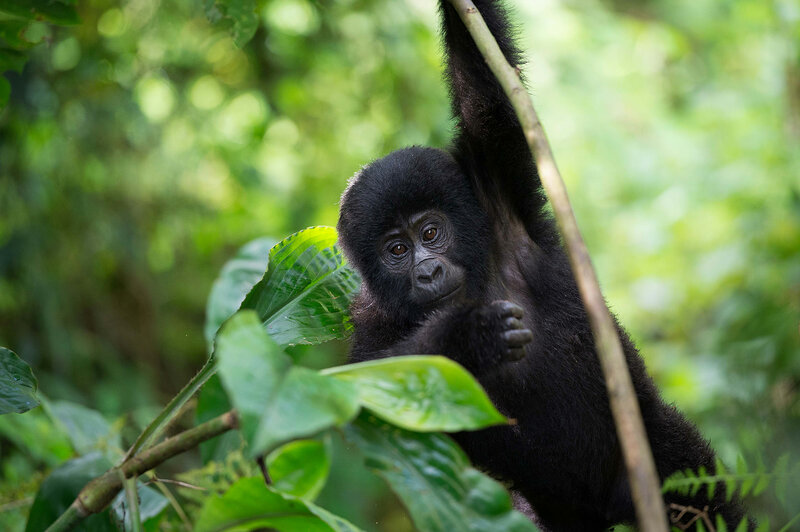 The positives: easy flight connections from Tanzania (perfect for a Serengeti/ gorilla combo trip), experienced guides, and gorillas that are very habituated to humans and photography. 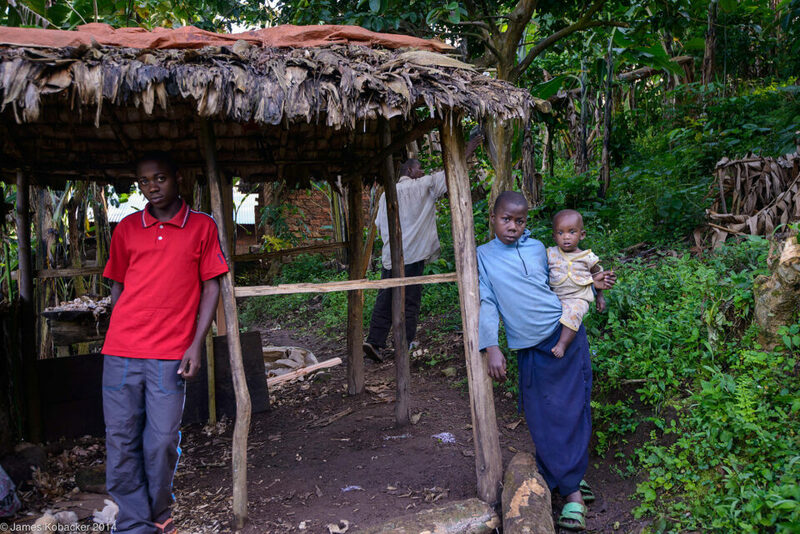 The downside to Rwanda is that the experience seems to be more “touristy” than the others. For instance, travelers sit through a local dance performance before heading out and they encounter large groups of people each day. (An important note: in Uganda and Rwanda each group is limited to 8 people, in Congo it is 4.) In addition, the surrounding farms run right up to the park. That means you might photograph gorillas sitting and eating in a farmer’s field. Uganda: the area here has not been as widely developed as Rwanda but there are still top-notch guides and trackers. The walks here are more uneven and arduous (but not by much) and it is possible to spend hours walking up and down terrain through thick brush. Trekkers may also have to cross a couple of streams and that means getting wet up to your shins. On the plus side, this experience feels much more natural than Rwanda and the crowds aren’t quite as bad. This is probably the least expensive option, but not substantially. Also, while the traditional safari spots in Uganda aren’t as strong as Kenya and Tanzania there are plenty of quality areas here. Finally, The Republic of Congo (not to be confused with the Democratic Republic of Congo): the gorillas here are a different subspecies (the western lowland) and the operation is new. The highlights include remoteness and the area is much flatter. Therefore, the walk to the gorillas’ habitat is generally easier than the previously mentioned spots. 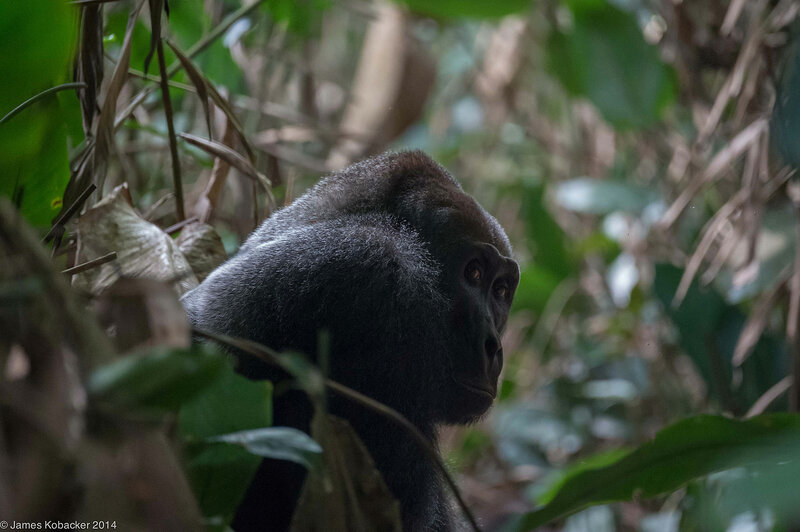 The downsides are that the brush makes it harder to photograph the gorillas and they are not as habituated to people. This means that it can be much harder to get close and photograph them. Also, this is the hardest location to combine with a traditional safari although the direct flight from Nairobi means that Kenya would be the best bet for a safari combination. 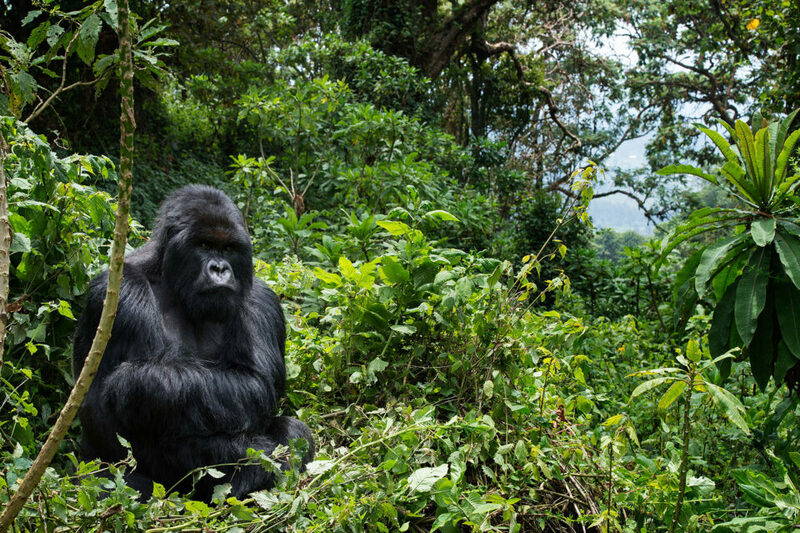 This location is probably best for people who have previously seen gorillas and are looking for a somewhat different experience. Viewing gorillas at all three sights is a similar process. 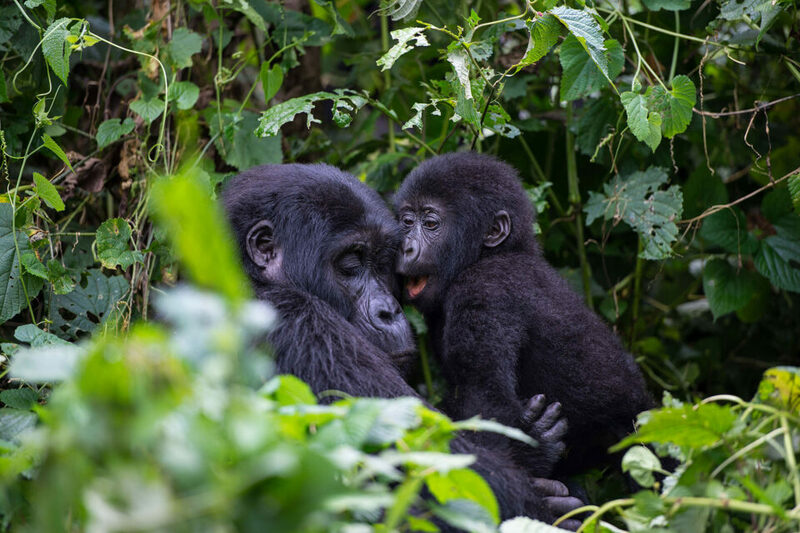 Once you get to the gorillas you will have an hour to spend with them. Their behavior will differ so be prepared for anything. Often they will relax and just sit around, giving you the opportunity to sit with them. At other times they will climb trees or you can spend an hour chasing after them through thick forest. I would recommend two days of viewing, if possible, since you never know what you will get. Finally, a little bit about gear first and foremost a good pair of boots and raincoat are necessities. The weather in this part of the world is unpredictable so comfortable, quick dry materials are a must. The weather can vary from area to area so finding the driest time to go is important. The bugs aren’t generally too bad in Uganda and Rwanda but they can be horrendous in Congo. A light daypack for camera gear and other essentials is important. 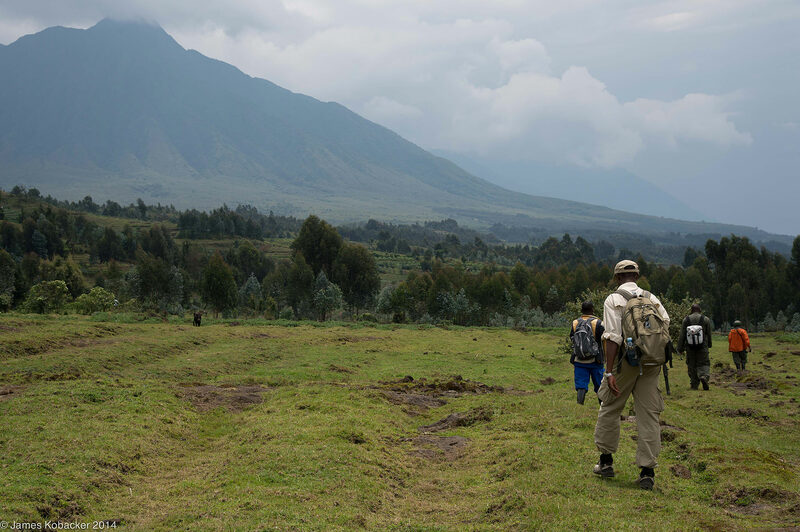 Because hiking to the gorillas can be a long and strenuous experience keep in mind that you can hire a porter to carry your bags in Uganda and Rwanda. The service is approximately $10 a day. This is one way that you can also support the local people, usually young people, and you don’t have to carry your own gear, which is nice. In Congo you’re on your own, so pack accordingly. Again with gear, someone, maybe you, will have to carry it for hours. 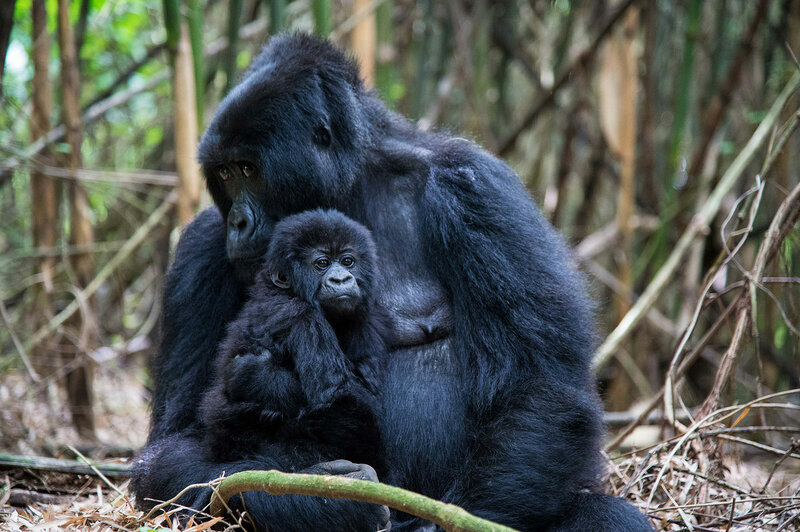 You are only allowed one hour per day with the gorillas so you need to make it count. 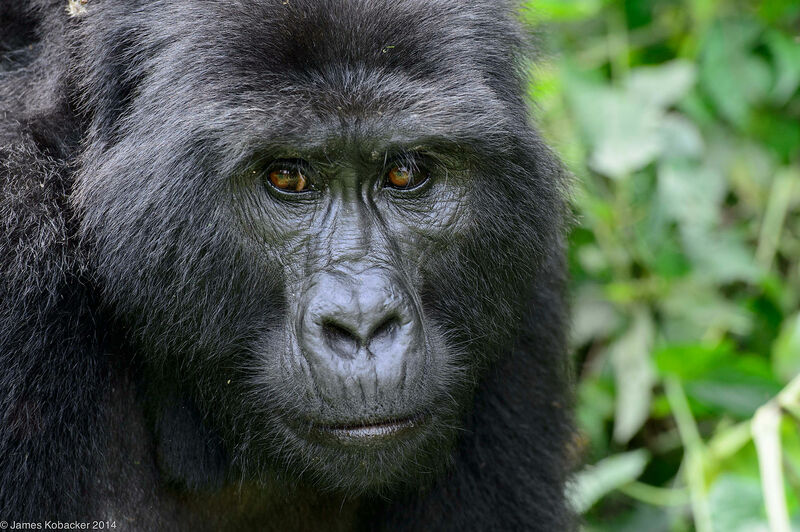 Typically rangers try to maintain a minimum of distance to the gorillas, likely five to 30 feet. While there you can’t put anything on the ground for fear that the gorillas might try to take it. My advice is one camera, one lens. For a camera I think the Nikon D750 would be a good bet. It’s lightweight, has great low light capability and autofocus (most of these shots were taken above ISO 1600). It is also quiet when shooting. For lenses the go-to is the Nikon 70-200mm f2.8. It has great image quality and an extra f-stop will make a big difference. Of course the 70-200mm f4 would also work. I think based on the size of the gorillas and how dense the jungle is the Nikon 80-400mm f4.5-5.6 would be overkill but might be worth it in Congo. If you’re lucky the gorillas may get fairly close in which case the Nikon 24-120mm would work well. I probably wouldn’t use the 24-70mm f2.8 since you will want a little extra reach and having VR is nice in these conditions. A prime lens wouldn’t work well in most cases since the distances can vary substantially and you may not be allowed to move around. Remember every lens and camera is a compromise; nothing will work perfectly so you need to think about what you want to try and realize you are going to miss some opportunities. Most people commit to two days of viewing so one day with each lens could be an option. 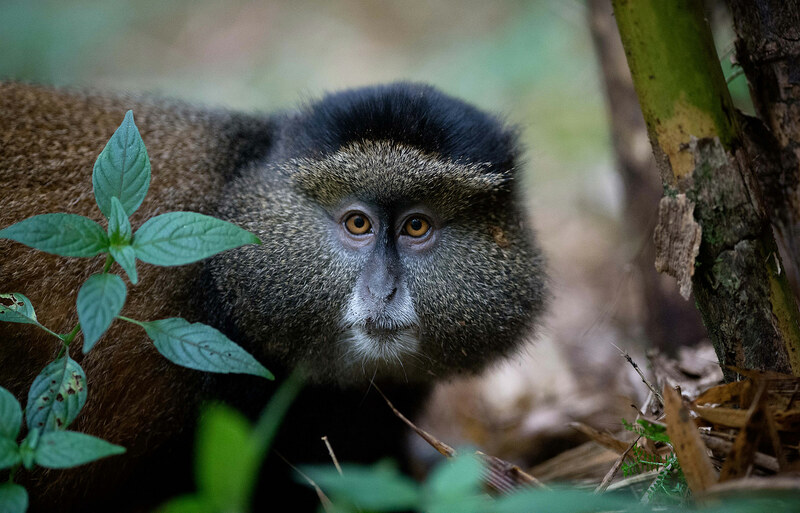 Also, something like the 24-120mm or a 16-35mm lens is useful to get shots of people or the forest along the way (people in East Africa are generally more resistant to having their picture taken so ask your guide). On the other hand you could take a point and shoot (like the Sony RX-100) to cut down on weight and the need to change lenses. My last piece of advice is to relax and enjoy, since you only have one hour with the gorillas. It can get a little hectic trying to shoot, especially with three to seven other people next to you. Try to take a deep breath and look around. This shot, in Uganda, happened after everyone crowded in to take pictures of a few monkeys. I decided to look behind us and saw this guy digging for roots by himself. This guest post was contributed by James Kobacker, a world traveler with an eye for dramatic and descriptive images. He began taking photographs 20 years ago and has used his skills to capture photographs of culture, wildlife and breath-taking scenery in 45 countries thus far. Kobacker is a National Geographic editor’s choice photographer and has traveled all over the world. You can see more of his work on his website. Pretty interesting read! Helpful tips for a budding wildlife photographer. Taylor, thanks a lot I appreciate it. Wonderful article, thanks for sharing your experience. Sitting in front of a computer screen in a concrete jungle, I am quite envious. Thank you very much it was an incredible experience. Lovely! Great images. 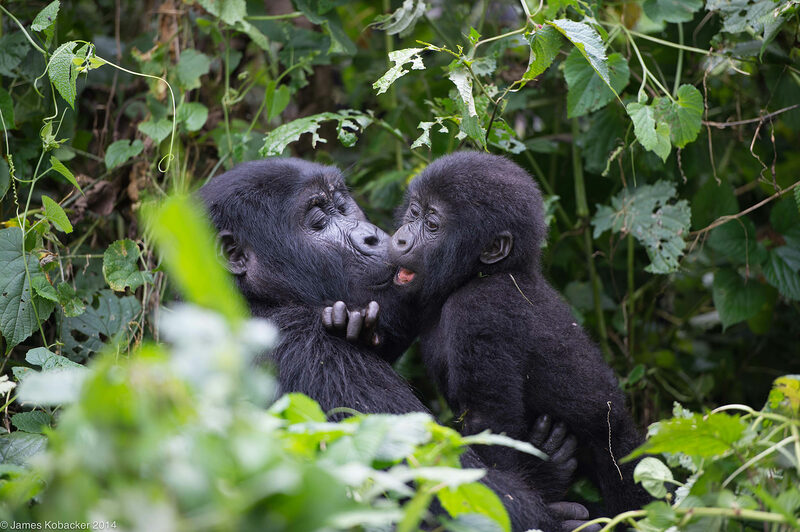 I had the good fortune to visit a gorilla family in Rwanda too a couple of years ago and it was an immense experience! It is both good and bad that the permits are so expensive; but if I could, I would do it again! Excellent advice and images! Thanks for sharing all of this! Thanks it was my first written post so definitely an interesting process. Beautiful, thank you! I love the baby gorillas. Sean, Thanks the baby’s are pretty amazing, lots of energy they will spend an hour running everywhere. Your photographs are captivating and I enjoyed reading your article. Just a few questions, in case I ever get a chance to do this – did you carry 2 bodies/2 lenses in? How close did you get? sounds like the gorillas are fairly acclimated to people. Why only an hour? Are there several groups and limits on the number of people per session? Last photo was with a 300mm f2.8 – did you only use that lens for that session? Definitely would get a porter to carry that lens around. Stephen, it is an amazing experience. I did not carry two bodies there’s no reason you couldn’t but it would be a little more cumbersome (keep in mind the forest is very dense) also they won’t let you put anything on the ground or take a bag with you when you see the gorillas (they’re afraid the gorillas might get interested and take it.) My thought was all of this would make two bodies tough unless you have someone to hold one for you. You get pretty close to them there was a baby that came up and touched the knee of a women in our group so there were times when the 70-200 was ‘too much lens’ and something shorter would have been nice. 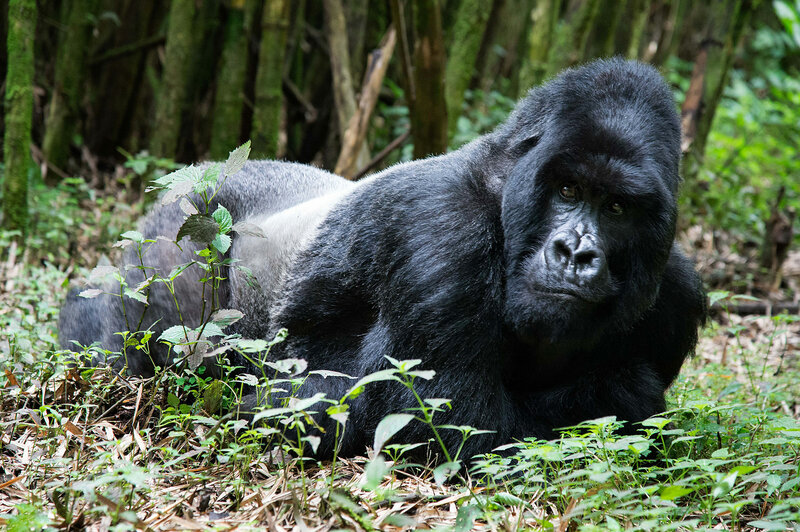 The one hour limit is an international standard that all three of these countries respect the idea is to not stress the gorillas by staying too long, so the groups are limited to 8 people for one hour and they don’t take multiple groups to see the same gorillas in a day. 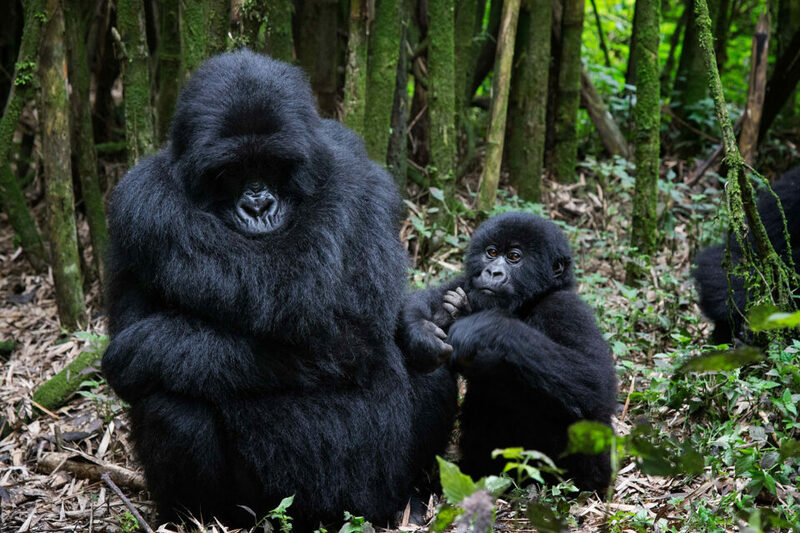 They do have multiple groups of gorillas to see though, Rwanda has the most, but either way they sell out of permits quickly so booking ahead or using a good travel company is a must. I did use the 300 2.8 with the monkeys which was a lot less of a walk then the gorillas my thought was that since they are smaller it would work better but actually it was way too long. If I could do it again I would have taken the 70-200. Thank you for the nice post and wonderful photos. Well, now that I finished to see your photos in a bigger size I’m really impressed. I have some technical questions. Did you use such big isos because the gorillas are black or because the forest was too dark ? Wich kind of metering did you use ? Some recomendations to postprocess this kind of photos without blowing out the lighted parts ? Thank you very much. Thanks for this. We’re off tomorrow and I’ve nearly the same camera as you–D3S. Was wondering how high the ISO would need to be and was concerned it would be too grainy. Hope it’s not too paparazzi-like when we do spot them. Like you, I tend to back away from the crowds and see what others are missing. Congrats on such nice work. Beautiful pictures. Well done. Jackie of Katona Tours and travel arrange our group trip. The trek in Bwindi forest Rushaga was tough and worthy it. I am glad I found this blog… great tips. Going to Rwanda/Uganda in Aug 2016. Will take one body and one lens 70-200 as recommended. I have just returned from an unforgettable trip to Rwanda to see the Gorillas. Like many others, I searched several sites for tips on cameras, settings etc. I would have to say that despite bringing two bodies and lenses (24-70 + 75-300) – thinking I would now cover all ranges, I absolutely missed my 100-400, the extra 100mm. The Gorillas were resting/sleeping in an area that was technically a bit difficult to photograph. They weren’t sitting upright as in some of these lovely photos on this site. If I had the 100-400 I could have focused more on faces, hands, feet etc because I just couldn’t get full frame gorilla shots. I know its a heavy lens (we walked 2.5 hours in and 1.5 hours out + 1 hour there), but it I honestly felt I missed it. Great article and awesome photos! I’m curious if you could recommend a compact camera. I know they aren’t good in low light, but my finances are tight and I also have no idea how to use a DSLR. I leave in February. I currently have a Canon SX280. Thank you!